1. 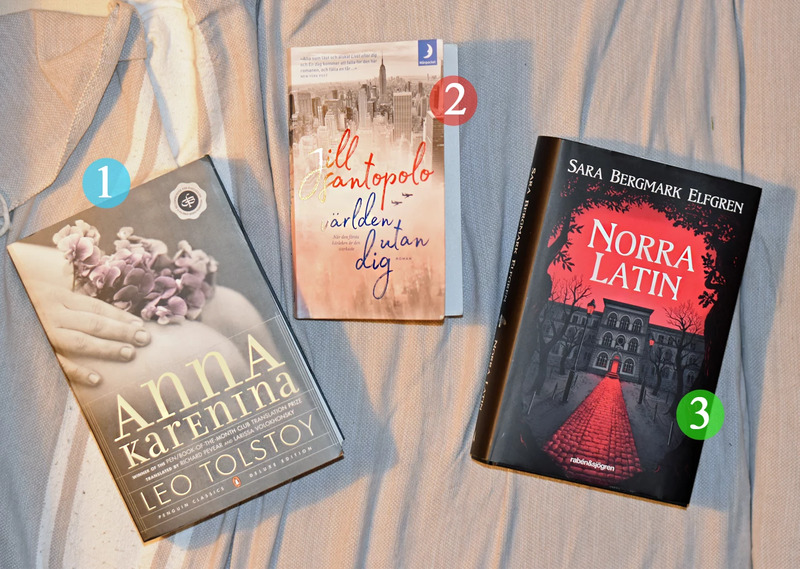 Anna Karenina - Leo Tolstoy: Since Leo is my grandfather's grandfather and one of the world's greatest authors throughout the history I feel very ashamed that I am 20 years old and still haven't read anything by him. So now I felt that it is really time for me to do it. And what I have heard Anna Karenina is very romantic and dramatic, which I like, and a literary masterpiecet that noone should miss out on.. I will read it in English, the newest translation. 2. Världen Utan Dig (Original title: The Life We Lost) - Jill Santopolo: A Christmas gift from Oksana, my cousins' mother. I've almost read half of it so far and I think this is the one I will finish soonest. Very romantic, about loving two people in two different ways at the same time. Takes place in New York. I read this one in Swedish, but the original language is obviously English. 3. Norra Latin - Sara Bergmark Elfgren: This was a Christmas gift to Frank from my grandmother, but I felt an urge to read it before him since it is the new book of the author of some of my favorite books (Cirkeln-serien). Takes place in Stockholm in a made-up gymnasium. A hint of fantasy.